FlightClaimEU started in 2016 as a vehicle to fight for airline compensation for passengers in Europe. By providing a fast no-win no-fee hassle free service, we will help passengers to claim compensation for flight delays and cancelled flights, receiving up to € 600 per person. know their rights and submit their claim for flight compensation to which they are legally entitled. This is because most passengers are unaware of their right for a financial compensation after a 3-hour delay or aren’t confident of the outcome. It also appears that most claims are rejected or the airline carriers doesn’t respond at all. We want to make sure that flight passengers are aware of their rights and to provide a quick cost effective and risk free service that is open to all eligible flight passengers. FlightClaim will be the “Gate” between Regulation and Compensation.  FlightClaim makes successful claims for flight passengers affected by delayed flights and cancellations. If necessary, we go to court for any client with a valid flight compensation claim and we don’t charge any money for this service until we have won the case. We work on a simple commission basis, which will only be requested when compensation is awarded. If you are eligible to receive flight compensation we will go to court to make sure you get it. FlightClaim works with a team of legal experts and high quality claim handlers, which allows us to expedite the process. We bear all legal cost expenses – court costs included – and only receive commission if your case is successful. FlightClaimEU is a trademark of CCN Aviation, a European TPA Claims Service Provider. The foundation of CCN is based on the ambition to truly innovate customer service concepts while helping companies overcome their challenges. In a constantly changing landscape, customers are expecting new innovative services from the travel sector with easy access to technology solutions and simple ways to report, track & trace a claim and communicate about its status and take-out unnecessary costs, delays and service dissatisfactions. CCN’s philosophy is to support clients in controlling and mitigating the total cost of claims with a platform that allows for fast, easy and simple claim handling. CCN handles cross-border claims within and beyond the European Union.